Hi everyone! I hope you are all having a wonderful week. I was sick on the weekend but I feel much better now with an exception of a runny nose, well, nothing so bad really. I will attend a reception today in the Central Palace of Stuttgart in a few hours. It is kind of a welcome to new professors. I am very excited about it. I will be wearing an Giorgio Armani Armani Collezioni Blazer (not affiliated) for which I've fallen head over heels. For my make-up I chose one of the new Suqqu Trios for the eyes (review coming up soon) and Guerlain products for my base. This year Guerlain renews two of the main products from their Météorites range. Their exclusive powder hosted in an exceptionally pretty refillable compact, Guerlain Météorites Voyage Compact Pearls of Powder, gets a beautiful white lid with pearl like structure. The powder is upgraded from 8 g to 11 g, kudos for that. We know it usually goes the other way around. I always found the older compacts a little hard to open. The new compacts have a bit more thickness on the sides so they open easier. The closure is magnetic as one would expect at this price point. I found the compact to be a little less heavy since the lid has more plastic, which in my book, is not such a bad thing since these are designed especially for travels. Take a closer look to the powder, it is stunning. 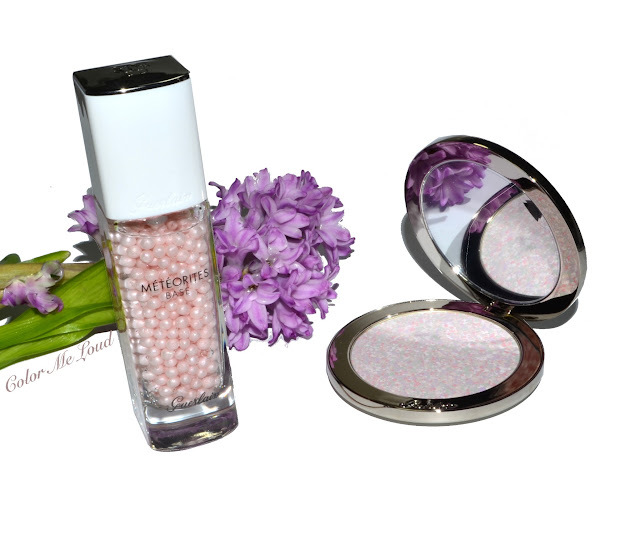 I love Météorites Compact Light Reveling Powder ( review for #3 Medium is here) and reach for it often. These are more affordable but the problem with these is that the different parts of the patchwork is worn out by different amounts since some shades are softer than the others. The surface of mine looks a little uneven at the moment due to all the usage. 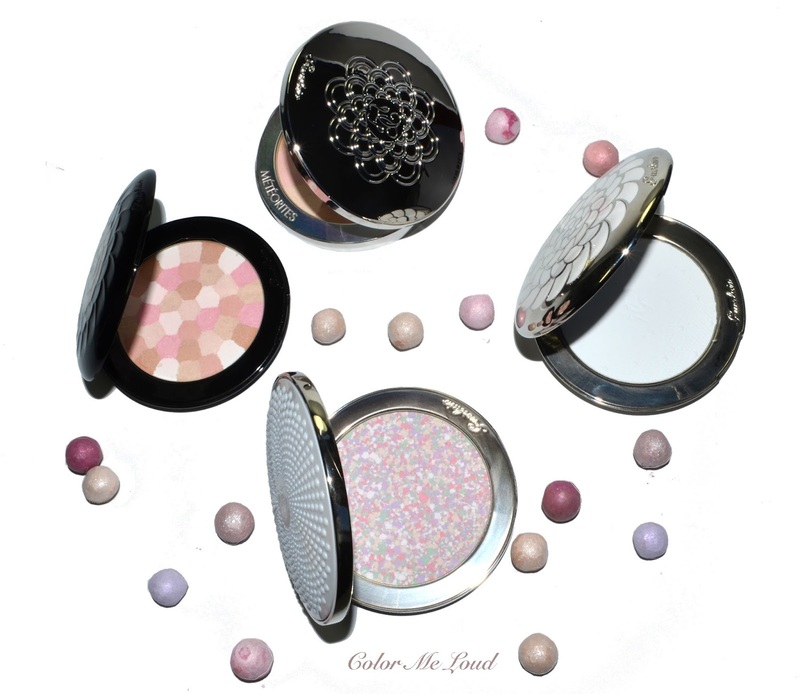 In Guerlain Météorites Voyage Compact Pearls of Powder, different shades are mixed very close to one another so they are used up by the same amount. This also assures that you get the same amount of each shade to perfection your complexion to the fullest. The powder is very finely milled and firmly pressed. It is interesting to see that this formula doesn't swatch so well but once you use a dense brush, like Guerlain's Meteorites brush (or I am using Tom Ford Bronzer Brush) to pick up the powder, it comes easily without getting powdery. It is very impressive to see a powder which is not powdery at all. That said if you insist to use a blue squirrel brush, like Suqqu or Chikuhodo, you wouldn't get the best out of this powder. The powder is perfumed, smells of something with wonderful violet, so Guerlain. By the way all Guerlain products are perfumed and now their upcoming lipsticks and even nail polishes will have perfume! Stay tuned about this, super exciting things are coming up. Although I am usually indifferent to perfume in make-up products, I am somehow excited about perfumed nail polishes, go figure. Have you tried any perfumes nail polish yet? I remember some years ago there was a Dior Collection with the greens and purples and nail polishes were scented. Loved them back then! Back to this beauty, the difference of Guerlain Météorites Voyage Compact Pearls of Powder from their Light Revealing Powder is that, this one is more mattifying and the lightening effect is much subtler but even more beautiful. You can see below that the formula of Guerlain Météorites Voyage Compact Pearls of Powder is close to the holiday compact (reviewed here) but it is more skin like, less white. I have included some comparison swatches with and without flash. These are swatched extremely heavily, just to give you an idea. You can see that Météorites Wulong and Météorites Compact are both more shimmery than two of the latest compacts from Holiday and Spring. Guerlain perfected the formula and made the blurring work without shimmer, big thumbs up for that. Balls balls everywhere, Météorites Base Perfecting Pearls Base is a gel like liquid around the pearls which give a subtle shimmer. The gel structure makes it very easy to absorb. In the morning when you are rushing, what you don't want is an additional step but because of the fast absorption time, I incorporated this to my make-up routine. The shimmery bits is very subtle but can be seen under low light if it shines directly on your skin before you apply your foundation. Guerlain Météorites Base Perfecting Pearls Base is another step to blur the imperfections and get an even toned skin. I can see that it prolongs the wear time of my foundation (which also happens to be Guerlain recently, I am so in love with Parure Gold Liquid). That said, I find some other base better for filling in the areas such as the edges of the nose. I will post a base smack down soon since I have been testing a few lately. 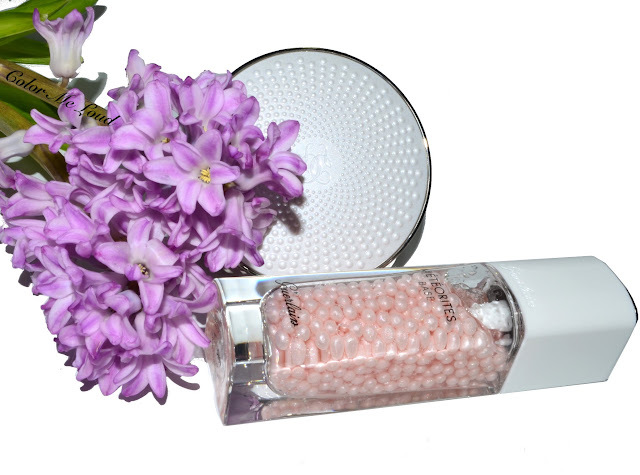 I found Météorites Base Perfecting Pearls Base to be the best for evening skin tone out and fighting the dullness. Final thoughts: Guerlain new Météorites Voyage Compact and Météorites Base Perfecting Pearls Base blurs the imperfections to perfection, to give you the even skin you are after. I find the new formula of the compact to be more mattifying, less shimmer, which is a thumbs up from me. The compact now has more product and yes it costs a small fortune. Good news is that once you invest, you can go for refills which costs around one third of the full price. Availability/Price: Guerlain Météorites Voyage Compact Pearls of Powder has 11 g of product, costs around 139€, refills are 49.50€. Météorites Base Perfecting Pearls Base has 30 ml and costs 63€. Both are now available in Germany. Which product are you loving/ can you recommend for evening out the skin tone? Thank you for your review and beautiful photos as always. Glad to hear you're feeling a little better. 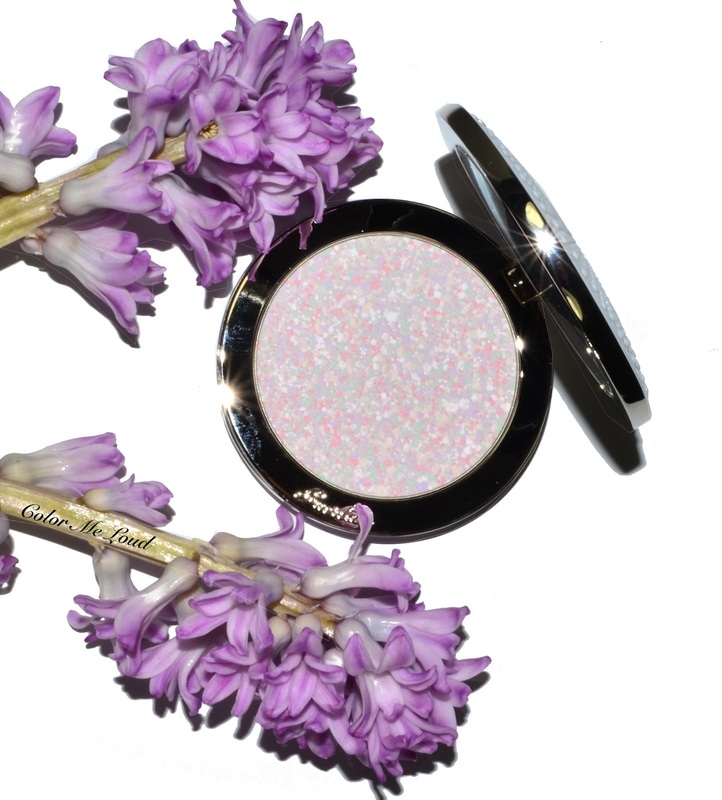 As I already have the Voyage Enchanté, I'm wondering whether to go for Suqqu powder this time. Do you prefer one over the other? Is one better at colour correcting? I like Voyage Enchanté for its blurring but I don't think it does much for colour correcting. Parabens, sunscreen or any nano ingredients? I try to avoid parabens in products applied to the whole face and I don't like sunscreen or nano particles in powders. 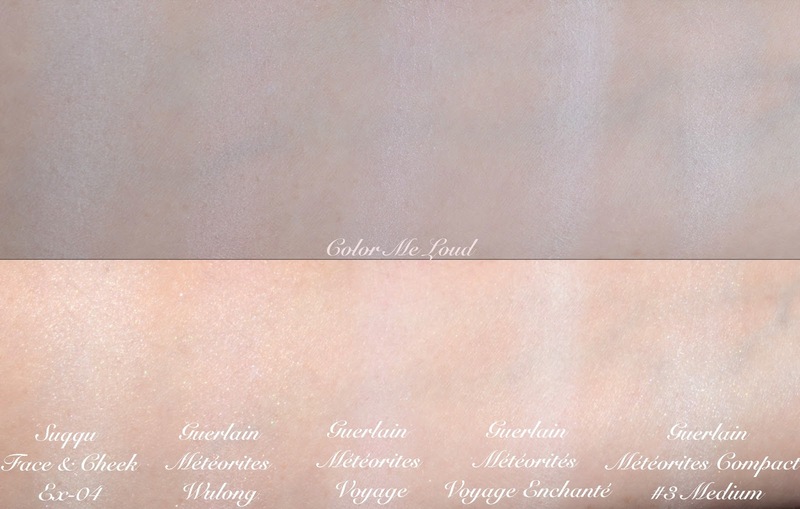 I've never tried the Météorites Base but am loving the new Météorites Voyage powder! Great review - reminded me that I finally need to order the Base Primer! Have a lovely evening Sara! Beautiful. Love Guerlain ( wearing Mitsouko for 20 years yet), and the violet perfume of powder too !! Hope you spent a perfect evening in Stuttgart ! Thanks so much, it was a nice evening. You are so right, I wrote iris by mistake, it is of course Violet. Just changed it :-) I was rushing yesterday, my mind was not working lol. these work wonderfully together so maybe you should look into the base too. I've been working a lot lately and didn't have the chance to read your posts so now I am trying to catch up! I got with 50% the holiday Guerlain palette along with the Holiday powder but now I want to invest in these two products also!!! I am really excited to read your thoughts on primers whenever you post about them! Perfumed Nail polishes seriously ?? I saw a nice dark purple with shimmer in a promo image and I cannot wait ! The base though, I'd buy it just for the balls in the bottle. They look so beautiful. LOL! Hope it is helpful, sorry for the delay. No nano ingredients, no parabens. only concern may be Tin Oxide? About Guerlain, if you have Voyage Enchante, I think you are good. You really don't need this one too, they are really close although this one does a bit more color correction but blurring effect is more visible. Get the base, it glows! Hi Sara, I am soooo drawn to that compact!!! It's stunning!! But it costs like SGD200++ here, which is insane considering a regular jar of ballz is only SGD90. There must be something wrong?? In any case, I remember those primers are lovely, and I still have a few of them unfinished in my drawer, but they're not very good for oil control unfortunately. I wonder what's the "improvement" on these apart from the packaging? Thank you very much Sara, it's really kind of you and very helpful. Also thank you for your advice re the new Guerlain powder. Since it's so expensive I'm glad to be able to skip it.